Well, it’s official—spring has sprung. If you want to ensure that your summer lawn and landscaping is top-notch, it’s time to start prepping. When you perform lawn care and maintenance in the spring, once summer rolls around you are more prepared to seed, plant, and simply enjoy your summer. Not sure what your spring lawn care list should look like? 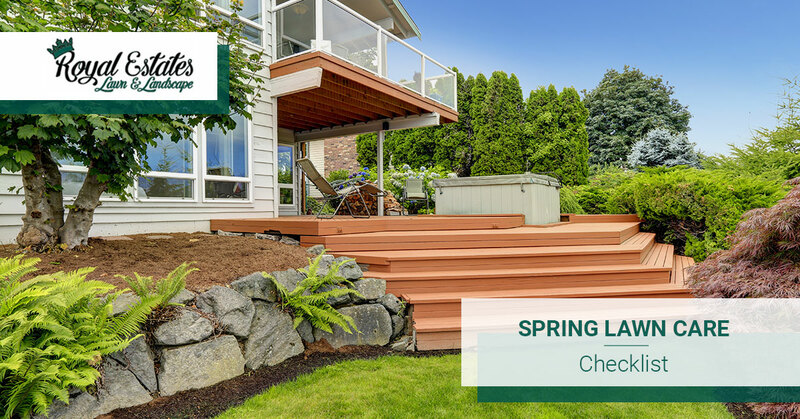 No problem—in today’s blog we here at Royal Estates Lawn & Landscape would like to share with you some tasks to include in your spring yard maintenance checklist. If you are in the Baton Rouge area and need help with your lawn or landscape, don’t hesitate to contact us! Here are some tips to help get your lawn off to a good start this spring! First things first, your yard needs to be cleaned. Depending on the condition of your lawn, you may want to start by raking up fallen leaves and dead foliage—if not picked up they can smother new growth and spread disease. Next, you want to clean up around plants, beds, and borders. If you have old mulch, now is the time to remove it. Mowers are an essential part of lawn care maintenance. Before you find yourself in peak summer—which is also peak mowing season—get your lawn mower ready. In addition to changing the oil, spark plugs, filters, and performing any other necessary tasks, you will also want to make sure your mower blades are sharp. Sharpening your blades will allow for your mower to make more efficient and better-looking cuts. Once your mower is ready to go and your lawn starts to green up, give it a quick mow. This will help remove the dead grass tops, allowing new emerging blades to grow. While you do want to get a nice low mow, be sure to not cut your grass too short. This can cause scalping and be damaging to your lawn. If you have a lot of perennials in your landscape, now is the time to prune. For ornamental grasses, you want to cut them back to roughly two to three inches in length. For perennial flowers, around four to five inches will work. Performing this type of pruning will give the new growth plenty of room to shoot up. Additionally, for any perennials that have been buried over winter, do your best to delicately uncover them and give them the space they need to grow. Also, if you want to spread out concentrated clusters of perennials, now is the time. When dividing them, be sure to leave at least three stems per clump. If you have trees that bloom in mid to late summer, now is also the time to prune them. Any tree or shrub branches that have been damaged can be pruned back to live stems. Remember that, while pruning can be greatly beneficial to the health of your tree, improper pruning can be detrimental. If you are unsure of how to properly prune, be sure to contact professionals. If you are in the Baton Rouge area, don’t hesitate to contact the lawn care professionals at Royal Estates Lawn & Landscape. While you’re on a cleaning kick, why not neaten up all parts of your yard? Simple tasks, like raking up escaped gravel, refilling joints between stones, and fixing old fences can make all the difference to your summer lawn’s appearance. Also, consider hosing down—ideally with a power washer with a low-pressure tip—your patio and walkways, paying extra close attention to any algae, leaf stains, dirt, and other build up. Mulching has a number of benefits. Not only can it thwart the growth of pesky weeds that can come up and take over your garden and flower beds, but it also improves appearance, protects plants, adds nutrients to the soil, and slows down erosion. While mulching is an essential part of lawn care and landscaping, you don’t want to do it too early. Typically, mid to late spring is a good time to begin mulching. You want to wait until after your little plants have gotten off to a good start and are established. If you want to learn more about mulching, give us a call. It’s one of our specialties. Also, be sure to check out our recent blog on the benefits of mulching. If you intend on having professional landscapers maintain your lawn this summer, now is the time to book your lawn services. Whether you need monthly, weekly, bi-weekly, or one-time services, the sooner you schedule your lawn and landscaping services, the better. Here in Louisiana, it is common to have a lot of lawn fungus, especially after a wet winter. If you notice this in your lawn, you want to get ahead of the problem and treat your lawn with the proper fungicide. If you need assistance, give our lawn maintenance team a call!